I love adding fresh fruit to my smoothies, but I also love the texture of frozen fruit. This recipe uses both. By adding freshly chopped pineapple to frozen strawberries, not only do you get a refreshing texture, but you also get that fresh pineapple taste. This smoothie is a little on the tangy side, so if you like it a bit sweeter, feel free to add more honey to sweeten things up. Add a slice of fresh pineapple on the side of each glass just before serving to give it a tropical touch. Now, where is my straw hat, bathing suit and beach towel? 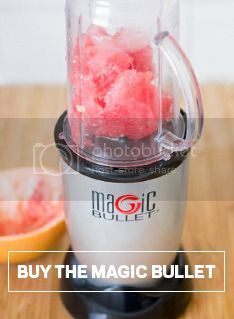 Add all ingredients to a Magic Bullet cup and blend well!